The crisis in the Central African Republic (CAR) has left humanitarian organisations, international peacekeepers and observers frantically searching for solutions to stop the conflict. Now, to make matters worse, the Afghan Taliban and the notorious al-Qaeda in the Islamic Maghreb (AQIM) – which, together with its allies, occupied northern Mali in 2012 – have denounced what it describes as the ‘ethnic cleansing’ of Muslims in the CAR. AQIM also issued a warning against France for its alleged complicity in the violence, saying the ‘supposed peacekeepers’ have launched a ‘crusade against Islam’ and that France will be punished for doing so. Given that ordinary Muslims in the CAR are clearly being targeted and tens of thousands of Muslims are fleeing the country, should this threat be taken seriously? David Zounmenou, Senior Research Fellow at the Institute for Security Studies (ISS) believes that AQIM is still smarting after its defeat against France in Mali last year and that their warnings are not to be taken lightly. The Organisation of Islamic Cooperation (OIC) also met last week to discuss the situation in the CAR and has pleaded for dialogue and national reconciliation – another sign that the crisis has now taken a decidedly religious turn. Yet, Zounmenou strongly warns against casting the conflict in the CAR in the same mould as other crises in Africa that are rooted in conflict between locals and radical Islamist groups, such as in Mali or Somalia. The Séléka, who staged a coup against former president François Bozizé in March 2013, is clearly not a radical Islamic movement and have no known links to al-Qaeda. Instead, it is made up of ‘a mixture of criminals, bandits, former soldiers, adventurers and everything the CAR government considered as outlaws,’ explains Zounmenou. After its coup in March last year, the Séléka unleashed a reign of terror across the country that saw looting and the killing of civilians from the majority Christian population, as Human Rights Watch reported at the time. The immediate priority of the peacekeepers was thus to disarm the Séléka. Yet, now, the anti-Balaka are in turn accused of leading a bloody campaign against all Muslims in the country. As of last week, over 80 000 Muslims had already fled to neighbouring countries like Chad, Mali and Cameroon. ‘Everyone is taken aback at how quickly the perpetrators and victims have swopped sides,’ says Zounmenou, adding that the anti-Balaka is not a new movement. The bulk of them are from the Central African Armed Forces (FACA), who had dispersed into the countryside after the coup d’état and were reorganised by former president Bozizé, who wanted to return to power. Religion has clearly now taken over what arose due to a lack of political stability and the absence of credible state institutions in the CAR, Zounmenou explains. Successive coups d’état have eroded any semblance of democracy in the country. ‘We know where the CAR is coming from. We know the country has never seen political stability and the changeover of power has hardly ever been peaceful; nor has it followed democratic principles and procedures,’ says Zounmenou. Last year, when the Séléka escaped the control of Djotodia and his former prime minister, Nicolas Tiangaye, the international community insisted that Djotodia restore order and bring his supporters to book. However, the killings didn’t stop. ‘What people didn’t understand was that neither Djotodia nor Tiangaye had an army or a police force to help them do this,’ says Zounmenou. Current President Catherine Samba-Panza is now in the same situation and has to rely on peacekeepers from France and the region to try and stop the anti-Balaka. 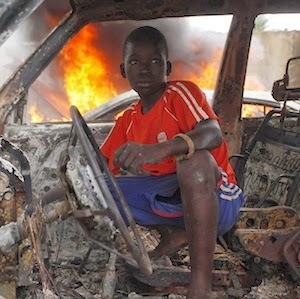 Zounmenou’s explanation of the political and socio-economic collapse of the CAR, as being at the heart of what has now become a religious conflict, follows on the heated debate taking place on social media platforms and in academic and media circles. On the blog African Arguments, well-known journalist and writer Michela Wrong has hit back against academics who accuse the media of too narrowly defining the issue as being a religious conflict. Wrong says ‘reductive’ definitions of conflicts such as the one in the CAR is sometimes necessary because journalists do not have the luxury of space and time to explain the background to the crises. ‘In many conflicts, the causes of the violence may well be myriad and complex – aren’t they always? But the way in which those tensions find expression once demagogic politicians and their propagandists get to work can be crude in the extreme,’ she says. In the current dire circumstances in the CAR, the two approaches can certainly be seen as complementary. Faced with an extremely volatile and increasingly complex situation, the international community has no clear strategy of how to stop the violence, says Zounmenou. Chadian President Idriss Déby, who is playing a key role in trying to resolve the CAR crisis, has proposed a roadmap for the country, while United Nations Secretary-General Ban Ki-moon is favouring an increase in the number of foreign troops to protect civilians. Amid some controversy, French President François Hollande has also decided to send French gendarmes, who do not depend on the French Ministry of Defence, to join the over 1 600 French troops of the Operation Sangaris in the CAR. These troops are to join the planned European contingents from Portugal, Poland and Spain, who are expected to be deployed next month as the European Union Force Chad/CAR (Eufor-RCA). Zounmenou says these initiatives could be positive, but should be part of a coherent strategy.